If you want to know who I am and what I do read on. If you aren't interested in these things, I guess you went to the wrong page. Several years ago my 85 year old neighbor was very unhappy that her birch tree was dying and had to be removed. Her late husband had planted the tree when they bought the house 33 years earlier. I asked the tree removal company to save me a couple pieces of the birch from which I made her some bowls. One bowl in particular still had some of the birch bark on it and she would show it to visitors saying, "This is my tree". When trying to decide what to name my craft business a few years later, I remembered what she would say and realized I had brought her tree back to life for her. Therefore, I started to use the name Reincarnated Trees. I still predominately use wood from trees that have come down in storms, died of natural causes, or have been removed for construction. "I would rather turn it than burn it." I have always heard that one should have an artistic philosophy, a justification for doing what you do. I don't know if this qualifies, but I have just always loved wood and working with it. There is something about the figure, grain, and mass of wood that is very pleasing. As I work with part of a tree that is no longer standing I am traveling back in time. I was recently given some wood from a 300 year old oak tree that came down in a storm. As I turned that wood, I was cutting down through growth rings that had started before there was a United States. I was working with wood that was alive and growing when Lewis and Clark explored the West. Perhaps Daniel Boone or Tecumseh had once walked beneath this tree's branches. I don't think about this all of the time, but to me trees are a link to our past. In addition, wood is such a natural medium to work with. It has texture and can be beautifully smooth or extremely rough. It can be full of insect life or sound and hard. Let's face it, I just plain like working with the stuff. What do we mean by "turning" wood? Turning is merely making a hunk of wood go in a circle and removing everything that doesn't look like what you want to make. If you cut away everything that doesn't look like a bowl, you will have a bowl. Complicated, isn't it? Turning has been done for thousands of years and all that changes is what makes the wood go round. We moved from human power, to water power, to steam power, to electric power, but the process stays the same. A potter makes clay go in a circle and manipulates a pliable medium to enclose space. A turner makes wood go in a circle and uses tools to open up space in a hard medium. Our two crafts are second cousins, that is why the shapes we make are so similar. Her she is in the nose of the plane. This isn't woodturning, but I thought it was interesting. I will avoid the metaphysical implications of this question and stick to some factual biographical information. I was born in 1948 in Indiana. After high school and 1 year of college, I served 14 months in Vietnam with the 101st Airborne. I completed a Bachelor's degree in Economics and a Master's degree in Business. I have worked for supermarkets, retailers, and restaurants in Operations, Human Resources and Training. In February of 2007 I joined United Road as their first Director of Education. United Road is based out of Romulus, MI and is a national leader in the car hauling industry. So far, this does not sound much like the background of a wood artisan does it? Well, some 40 years ago I told my wife I wanted to make a bowl and I went out and bought a lathe. (She told me I could buy a bowl a lot cheaper.) I have played around with wood turning ever since. By the way, we are still married, so I guess she qualifies for sainthood. For years I attended Renaissance Fairs in California and later in Michigan. People would ask me where I bought my mug or my fancy wooden sword and I told them I made them. I finally decided I should try selling them. In 1998 I opened a booth at the Michigan Renaissance Festival and, as they say in all the great biographies, the rest is history. It is nice to have a hobby that is fun and self supporting. We added a 16 by 20 foot workshop to the garage. This is a picture of the inside. 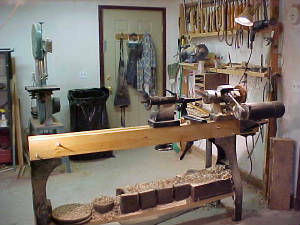 The lathe in the foreground is a Conover with a wooden bed. The basic design is about a century old, but the motor and working components are quite modern. When people ask me if I do all my work on my human powered lathe, they see at the festival, I respond with, "I am merely eccentric, not crazy." This is where I spend my free time during the winter months, preparing products to sell at the festival. 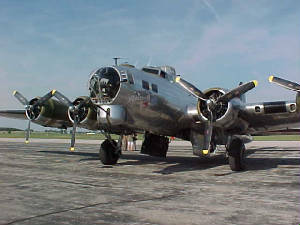 My wife loves B17's. 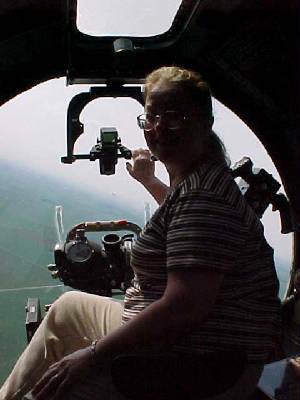 In 2006 I arranged for us to take a ride during Thunder over Michigan. 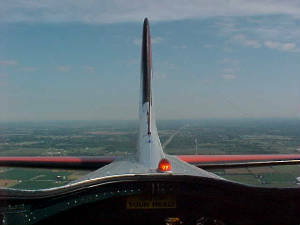 A view backwards from the upper turret. I was on the plane, but was pretty much relegated to picture taker. This was my "artsy" shot.